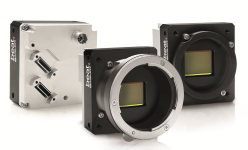 High speed and high quality images: the Basler beat high-resolution camera offers both, with its super-sensitive next-generation CMOSIS sensor CMV12000. Its image quality far exceeds that offered by older CMOS sensors, and is easily comparable with the image quality of CCD sensor cameras. The Basler beat beA4000 camera features both a mono and color model at a full resolution of 12 megapixels, with progressive scan and global shutter technology. Superior image quality even at high image capture rates and high resolutions makes a convincing argument for this advanced camera family. The CMOSIS CMV12000 has relatively large 5.5 micron pixels for great sensitivity. Its global shutter is ideal for imaging objects in motion.